Posted on December 24, 2017 by Lea S.
If you got to go back in time to the Golden Age of Hollywood and spend Christmas with one of your favorite stars, who would you pick? It would be a really tough decision, but if you were factoring in stars who were really, REALLY into Christmas, then Harold Lloyd should probably top your list! Harold and family (and friends?). Not sure where this image came from, but it’s a nice one, isn’t it? On his 15-acre estate Greenacres, boasting a 44-room mansion, 9-hole private golf course, a 900-foot man-made canoe stream, and what was once southern California’s largest swimming pool, Lloyd “knew how to keep Christmas well,” as Dickens would say. 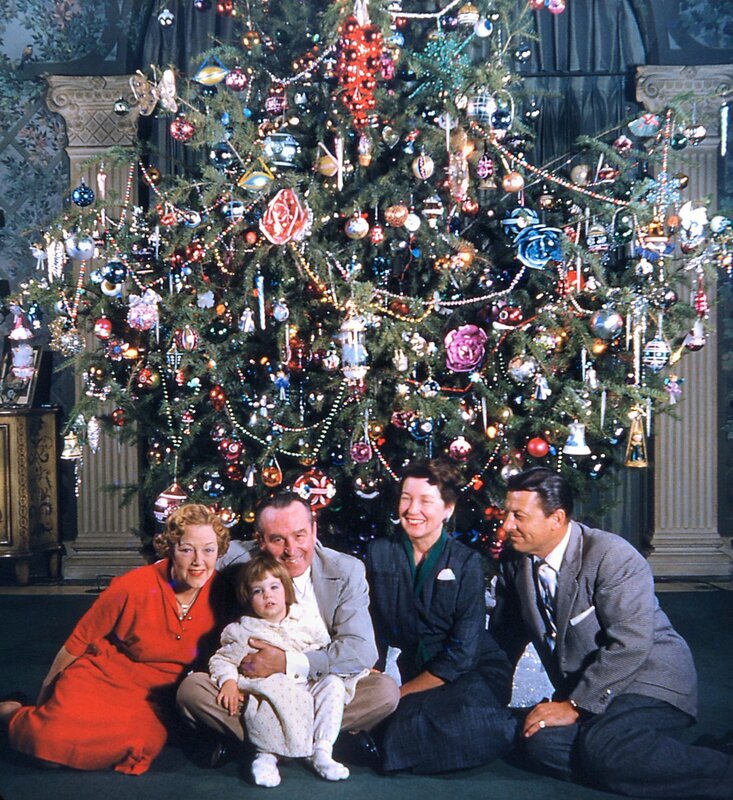 The main attraction of the Greenacres holiday season was always its mighty Christmas tree…which, as befitting its silent comedy megastar owner who always thought big, was no ordinary tree but three trees lashed together. The ginormous decoration was 20 feet tall and no less than 30 feet around, and stood proud at the end of the Lloyd family’s orangery. 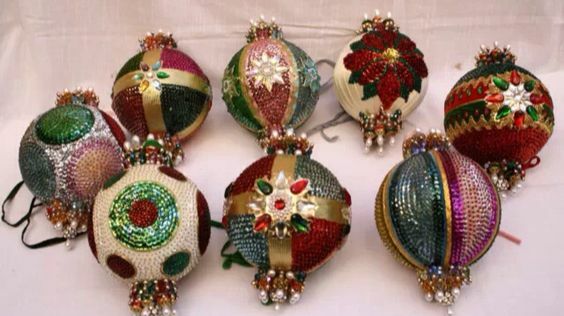 By the 1950s it held something in the neighborhood of $25,000 worth of ornaments collected from around the world–and was starting to be left up until March. Pretty spectacular, eh? Ah, but this must’ve been earlier on in the Saga of the Mighty Tree. 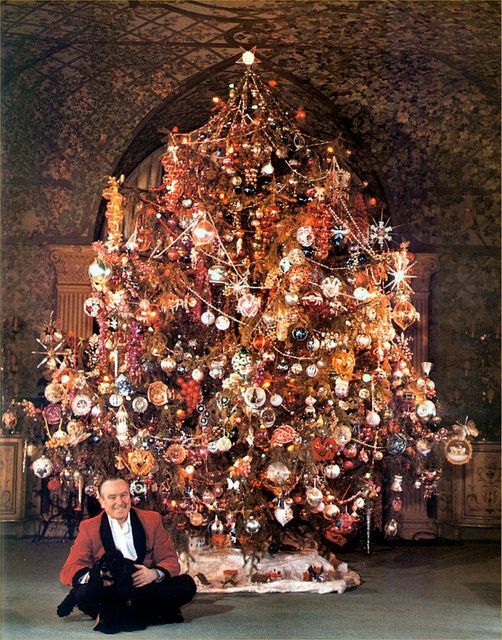 For by the 1960s, not only had Lloyd’s ornament collection grown to even more ginormous proportions, but the business of decorating the tree had become so time-consuming that the Lloyds decided to keep it up year-round. Just look at this beast. I remember a jeweled encrusted ostrich egg, and a sequined football (a reference to the college football hero Harold Lloyd played in his most popular film, “The Freshman”). 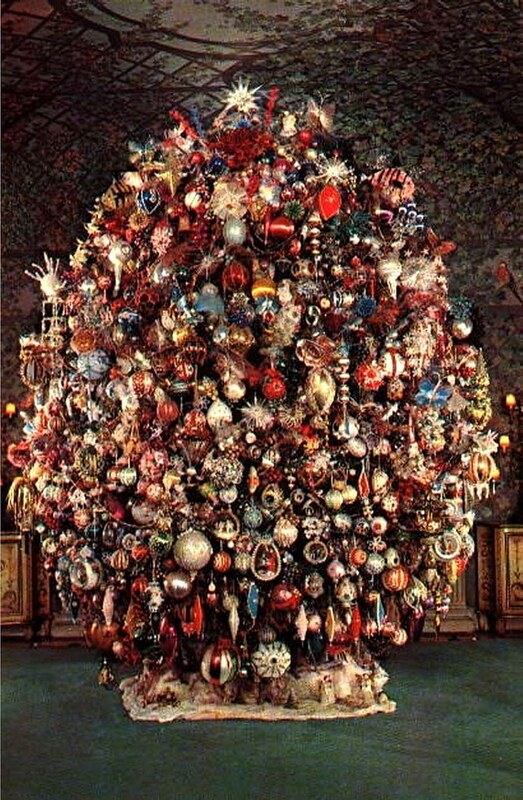 I particularly loved a Christmas ball given to him by his friend, make-up artist, Wally Westmore, that was a miniature diorama depicting a bespectacled Harold in a red bathrobe trimming the tree. Every once in awhile an eBay auction will claim to have ornaments from the Greenacres collection, but I’d stay skeptical if I were you. Today, many years later, Harold Lloyd’s love of Christmas is a permanent part of his epic legacy. So I’d say that if I were to head back in time for an old Hollywood Christmas holiday, that Greenacres “is the place to be”! A very Merry Christmas and a joyful holiday season to all! Only a few days left of 2017 to go…I’m already looking forward to Silent-ology’s plans for 2018! This entry was posted in Exploring the Silent Era and tagged Christmas, Christmas tree, Greenacres, Harold Lloyd, Suzanne Lloyd by Lea S.. Bookmark the permalink. Wonderful way to end the year. Merry Christmas, Lea! Thank you sir–Merry Christmas to you, too! That tree is amazing. I’m sure there must have been times when they felt like they couldn’t be bothered to put it up though, as it was just so much effort lol. I heard the whole family would spend time hanging ornaments every day for weeks! I can see why they decided to just keep it up forever. That is an epic tree and a wonderful story! Thanks Lea! 😁 Interesting you’d bring up Mr. Lloyd- my brother, who is a bartender, and I were just discussing possible ingredients that might’ve gone into “The Diddlebock” and we decided to try to concoct something that matches it’s description over the Christmas holiday! I’ll let you know how it turns out (and if it makes you whoop and holler like he did!) 😁 Merry Christmas! 😃 I’d love to hear how it turns out! Merry Christmas, Debbe! So our Diddlebocks came out great! We tinkered around with the recipe a bit and ended up with something just like Harold describes- “very mild”, “very pleasant aroma”, kinda like “lemonade” and a “fruit cup”. 😁 We even found an ingredient list for Sozodont toothpaste floating around out there that helped! (I say “we”, but really it was my genius brother who did all the figuring.) One thing that was just like the movie was that NO ONE could get the name right! And some of the attempts at it were pretty hilarious (and probably unprintable!) Happy New Year, Lea! Merry Christmas to you! And a happy New Year! Merry Christmas to you too, Robert!